Before I caught the big-screen cinematic adaptation of the hit 1981 Broadway play Dreamgirls, my only frame of reference for the music and message was witnessing Jim Carrey sing “And I’m Telling You I’m Not Going” in an unforgettably hilarious serenade atop an office desk to Garry Shandling on the final episode of The Larry Sanders Show (side note: fans of Sanders must check out the new "Best Of" box set). Needless to say, although I had nothing with which to compare the film, I had a wonderful experience in my initial viewing of the movie and was completely blown away by the show-stopping numbers and classy attention to detail that rivals Rob Marshall’s Chicago as the best recent big-screen musical in years. 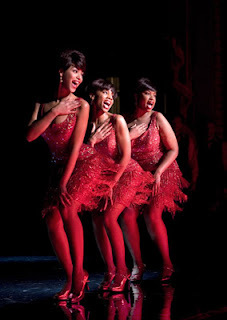 Director Bill Condon (who also wrote the screenplay for Chicago) proved to be a masterful director in his execution of the piece which, loosely based on the story of The Supremes and beginnings of Motown in general, focuses on a trio of young, talented, beautiful singers who “make their way to the top” from amateur talent contests, to singing backup to a James Brown inspired Eddie Murphy (in his best performance since Bowfinger) before becoming their own super-group until ego, fame and fortune begins to divide them. Academy Award Winner for Best Supporting Actress Jennifer Hudson steals her numbers as Effie, the proud and tremendously gifted singer whose stubborn ways and diva-like behavior help alienate the group and although the acting talents of the former American Idol contestant leave a bit to be desired, her charisma is off the charts and she helps challenge costars Anika Noni Rose and especially Beyonce Knowles to turn in her best performance so far, although her less flashy character really doesn’t come into her own until later in the film. Winner of the 2006 Golden Globe for Best Picture Musical or Comedy and nominated for several Academy Awards, Dreamgirls was conspicuously left out of the Best Picture race when Oscar time rolled around and although Hudson’s win was a coup for the film, I really feel that it was worthy of a spot as one of the finest films of last year and the type that Hollywood does best when working within the studio system to guarantee both entertainment, emotional involvement and the ability to inspire awe in all levels—fans of classic MGM musicals will be in heaven and although there’s no way to duplicate the big screen impact, the DVD transfer is remarkable.